On January 5 the Dutch spotting championship (Nederlandse Spotters Kampioenschap - NSK) 2018 was held in conjunction with the Scramble Aviation Day. 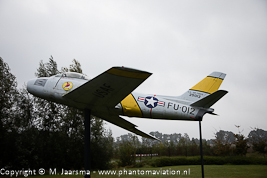 For this occasion Teuge airport was chosen as location. 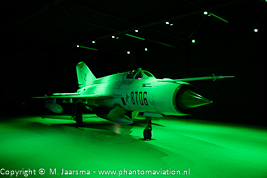 At Teuge Skydeck has former military aircraft preserved which could be photographed in the hangar in the evening. The aviation day was centered around several stands selling all kinds of aviation related material and from 13.00 the NSK started. The winner of the previous edition, EWAS (Eindhoven Welschap Aviation Society) organized the NSK with 40 questions divided into four rounds of 10 questions each and a half hour break in between the rounds. The questions themselves were divided into sub questions related to both civilian and military aviation. Until question 36 the rank of the 15 participating teams (each three persons) was shown but from the 37th question the standings were hidden. It turned out that an additional 41st question was needed to determine the podium. 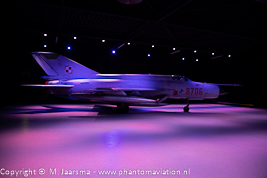 After the award ceremony the interested photographers had plenty of opportunity to photograph the former Polish Air Force Mig-21MF and Czech Air Force Mig-23ML. 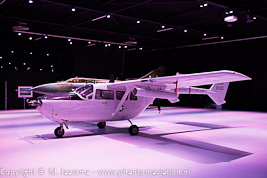 Furthermore the O-2A which is in flyable condition was towed into the hangar. The An-2 remained parked outside with the F-104G Starfighter painted in 322 squadron markings remained in the other hangar. 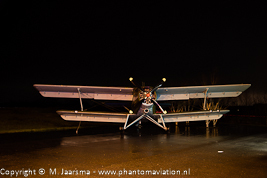 The O-2A and Starfigher are owned by stichting Postbellum. (SP-FVB) An-2TP Preserved Outside in front of Skydeck hangar in People's Liberation Army Air Force (PLAAF) colors. 25012/FU-012 CL-13B Preserved Ex German Air Force JC+240 (CL-13B Mk6). On Pole outside. 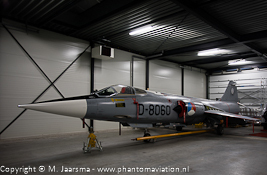 D-8060 F-104G Preserved Ex German Air Force 24+46. In hangar. 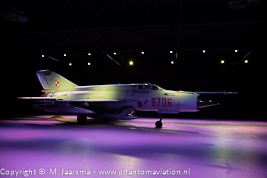 8706 Mig-21MF Preserved Ex Polish Air Force. In Skydeck hangar. 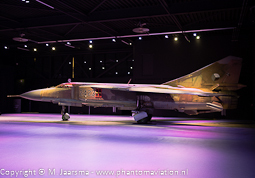 2423 Mig-23ML Preserved Ex Czech Air Force. In Skydeck hangar. 21300 O-2A Flyable Ex USAF 67-21300 and USN 721300. Civilian registrered as N590D. The Mig-21 could be photographed in four different light settings: white 'regular', red, green and blue.